Governor Ayodele Fayose of Ekiti State has described democracy as dead in Nigeria. “With the show of shame that happened in last Saturday’s Osun state governorship election in general and the Thursday rerun in particular, there is no other conclusion to draw than that democracy is now dead in our beloved country”, he said. In a statement by his Chief Press Secretary, Mr. Idowu Adelusi, the governor decried the conduct as well as outcome of the said election. “With what happened in Osun state, democracy is actually dead in Nigeria and we are in critical times. “The Osun supplementary elections was just a repeat of what happened in Ekiti state on July 14th. And it is unfortunate that, again, the will of the people has been perverted. The Ekiti governor commended Senator Nurudeen Ademola Adeleke for having fought a good fight. 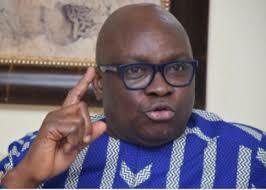 Fayose then condemned the violence that attended the election, sympathised with the families of those killed and enjoined PDP members to refrain from taking the law into their own hands. “Help will come soon” he said.